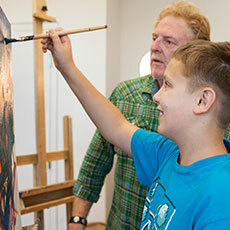 The goal of the Talented in Art program, a collaboration of more than 25 years between Bemis School of Art and School District 11, is to challenge and accelerate advanced art students in grades 3-5 and is intended to develop the student’s academic potential and to excel them in art with an in-depth comprehensive understanding of visual arts. All courses are designed to include lectures, interactive projects as well as visits to the Fine Arts Center galleries. The Colorado State Content Standards will be applied to the Talented in Art program. To participate in the Talented in Art program, your student/child must be between grades 3-5 and be nominated by a District 11 teacher. If you are interested in this program for your child please contact your child’s teacher or principal.